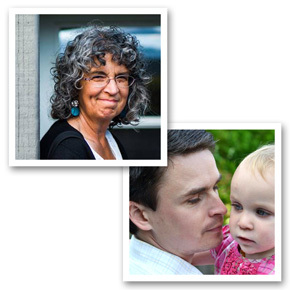 Doorposts is giving away one Parenting Essentials Package, worth $59.00. This new discounted package gives you five Bible-based charts to help with character building, discipline, and sibling relationships in your home, plus our bestselling topical Bible for parents. Two lesson books for the charts and two paper dolls are also included. If you’re new to Doorposts, and you want try our parenting materials, the books and charts in this package are the best ones to start with. 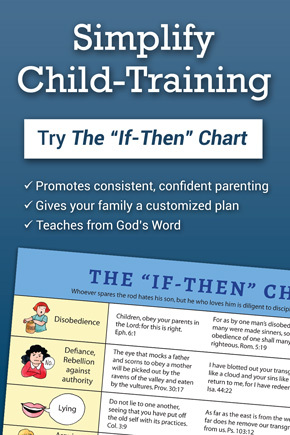 The If-Then Chart – For Bible-based, consistent discipline in your home. 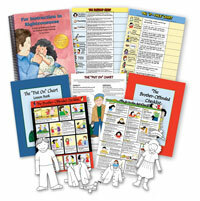 The Blessing Chart – Recognize and encourage your child’s godly behavior. The Put On Chart – Learn to put on biblical character qualities like patience, humility, and forgiveness (includes a lesson book with 8 studies, and a boy and girl paper doll). The Go-to-the-Ant Chart – What the Bible says about diligence and laziness. The Brother-Offended Checklist – Teach your children to resolve disagreements in a godly manner (lesson book included). This package comes with either small charts (8.5″x11,” full-color, laminated), or large charts (16″x22,” black & white, un-laminated). The small charts are more durable, and fit more easily on your walls, on the fridge, or in a notebook. The larger charts can be better for young children, or if you want to color them at home. Click below to use the easy giveaway form! These are such wonderful resources! We started celebrating it today and plan on continuing the tradition. Nope! Never knew of it until today! Nope. 🙂 LOVE this giveaway! FINALLY!!!!! I was REALLY hoping you would give this away!!!!!! PLEASE pick me!! I NEED THIS! 🙂 No, we have never celebrated St. Nicholas Day. Thanks! no! It wasn’t even on my radar until this year, and I completely missed it! Thank you SO much for this wonderful opportunity!!!! There is NO way I could get these other than winning them. No – but we might just have to start! No,but may after this year. This set is fantastic! Thank you!!! Ive never heard of it until now, so no, we don’t. We did sinter clas like in holland ! That was fun! I also didn’t know it existed…so no so far, I haven’t celebrated it. No, never knew of it until now. Thanks for the wonderful opportunity to win! No. I’d LOVE to win this!!! We just started celebrating it this year. No, never heard of it I guess. Looks amazing! Love your materials!! No. I did not know it existed until this year when studying the history of Santa Claus. We will probably start something next year! Oh what a blessing it would be to win this!!!! New to Doorposts so much good stuff i am so excited!!! I want this BAD! All our Doorposts things are falling apart from being used constantly for over 15 years! Yes! I blogged about the details today! Answered on FB! We like to for fun, to keep the focus on Jesus on Christmas. We love the Doorposts materials we currently have. Not this year…but we will next! what a wonderful generous giveaway! We do not celebrate St. Nicholas Day. No, we’ve never heard of it, but we are anxious to start a new holiday tradition! I really really would be so honored to obtain this set! It would bless us indeed. Would love to use this with my boys! No we don’t but will be looking into it in the future. no but my brothers family does. Yes! I blogged about it today. No, we don’t, but I will look into it as this is the first time I am hearing of it. I’ve never heard of it! No I had not heard of it. I have however had my eye on your behavior charts for some time now. I would love to win them to go along with our Plants Grown Up. Thank you! Nopedy nope, but would love it! Bad me, totally forgot it’s St. Nicholas day. Dutch heritage so my mom would always have me leave my wooden shoes (purchased over here on the west side of the state -Michigan) outside for goodies. My 4th grade teacher and her would come over here to Holland and buy dutch candies and such to fill my shoes. I use to be better at remembering it with my older kids. Nope. Never even heard of it til today. We don’t, but I wasn’t aware that there was a day set aside. We do not. My husband grew up doing that in Germany. They did not do Santa then, though sadly it is becoming popular now. No but thinking it might be nice with the little grands next year! I’ve never heard of it before this year. I have never heard of it until now, but I will have to research it and maybe next year start something! We would love to have this resource. No. I’ve never heard of it. Today I was just speaking to a friend who mentioned it to me. I had never heard of it before, so no we don’t celebrate. No, but if I will St. Nicholas Dayy will always be a reminder of God’s love! No! We have talked about it but never celebrated. No – we dont celebrate it… honestly Ive never heard of it before! Hoping to win this set… I could sure use it!! No, we don’t. It’s always been one of those traditions I’d love to start, and never have. No, hadn’t heard of it. Will have to do some research! Theses would be a great tool To use and share with my home school mom friends. I have never heard of St. Nicolas Day. Very interesting. I will definitely begin researching it for next year though. considering it for next year. Thanks. Not officially, but we did do St. Nicholas Day crafts and read a story! No- we do not celebrate this holiday. No we don’t celebrate saint days or practice Santa. No we do not, didn’t know it was an actual “day”. We do not celebrate St. Nick Day….we do, however, celebrate 3 Kings Day which it the day it is believed that the 3 kings came to deliver gifts to the newborn King…..
We don’t but it’s interesting! No we don’t… don’t see the biblical reason to do so. I love the resources you have up for giveaway! Thank you for the opportunity to possibly win them. we have talked about it with the kids & Sinterclause (dutch santa) but we dont really do much though…. No we do not but maybe we will start. Would REALLY love to win!!!! We haven’t in the past, but you never know! To be honest, I’ve never heard of St. Nicholas Day!! No, we don’t. Do you? Liked you on Facebook. Have the book and love it. Would love to win the rest of this package and if the book came with it I would bless someone else with it. We do not Celebrate St. Nick’s day. I had never heard of it before today! I’ve never heard of this holiday but plan to learn more about it. Would love all these resources! No, I never heard of this. But I’m definitely going to look it up now! Was not aware of it, so “no” we do not celebrate it. Your give away looks awesome, would love to have it ! No – but I would like to win this! Learning new things this season! Oh this is another one I really need. I feel like I am failing at parenting with the right heart and this would just be a super blessing to win. I never knew there was a St. Nicholas day until today! Not really. Partly because we didn’t know it was today. We do however tell our kids the TRUE story of Saint Nick. I never even really heard of it, so no, we don’t celebrate it. Nope, never heard of it. We will have to look into it. No, I have never heard of it till today…maybe next year! What a blessing it would be to win this awesome package! We never have, but I want to learn more about it. No we never have. Will be looking in to it. I’ve never heard of St. Nicholas’ Day. I hadn’t heard of it before, but I am going to do some researching, from what I have been reading here we may very well start a new tradition in our home!! Can’t wait to learn more about St. Nicholas Day! we don’t. not yet, anyway! Hmm, I have never heard of it, so we do not celebrate it. We do love the story of St. Nicholas, though! No, I just heard of it for the first time the other day on AmbleRamble’s yahoo group. We do, but on the saturday closest to that date. We did growing up, but I have been bad about keeping up the tradition with my kids. When we are overseas, yes, we do. But today in the US, we didn’t! No we don’t celebrate it. I didn’t know much about it until this facebook party. I just heard about St. Nicholas Day this morning from a friend who celebrates it. Have not heard of it. Need to look it up. Have wanted Instructions in Righteousness for 1 1/2 yrs. I would love to win this!!!! No. But I think it would be fun sometime! He’s an example of how to love Jesus by loving others. No, we never have. Maybe next year. Love the idea! We don’t. But we do celebrate throughout Advent by reading books about the season including ones about St. Nicolas. We don’t celebrate, in fact I had no idea it was today! Thanks for letting us know! Would love to win For Instruction in Righteousness– your blog posts are so very wise and helpful. With three littles, I am definitely seeing my weakness and need His strength and help from His people. Thank you for your ministry. No, but I would love to research it! Thanks. No…but I would love to know more about it! Yes, we did, and we had a lovely day! No…we spend the month doing Advent activities and a Bible study each day. No, I haven’t heard of it. We are reading the advent story Bartholomew’s Passage. No we don’t, but I keep intending to start that tradition. No… Thanks for the giveaway! No, never really knew of it. no, I hadn’t heard of it until now…. Never heard of it! We did watch Charlie Brown’s Christmas tonight, though. So is that sort of celbrating? We celebrate a traditional Christmas for gifts. This year, we made a family event of watching Veggietale’s Saint Nicholas: A Story of Joyful Giving for St. Nicholas day. We don’t, yet. But I want to! I love your books and charts. These make great baby shower gifts. I’ve never heard of it. I’ll have to learn more about it now! We were planning on it, but Tuesday is a hard day for it to fall on. I think we will do something on a different date. No, I had not heard of it before. We are considering it now though! Thanks for the chance to win! No, hadn’t heard of it until today. Yes, we do celebrate it. The kids get a stocking filled with a few small trinkets. We do go over the true story of St. Nicholas before the day so they know why we celebrate it. 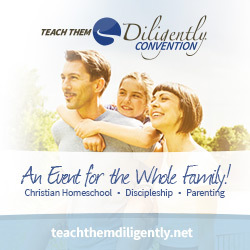 I would love to win this as I homeschool my children. What a great tool to use. We don’t celebrate St. Nicholas day but my children were just asking about Santa and we told them a little about St. Nicholas. This would be such a wonderful thing for our little ones. Never heard of it, but sounds like a great way to teach the kids about St Nik! Went to bed last night before this giveaway was posted. Glad I saw it on time. So want to win it! Love your resources. Thanks for the chance to win such a great prize! My family and I are very interested in using the Doorposts Parenting Essentials Package. We believe it will be a great tool to ensure consistency in discipline. I’ve never heard of St. Nicholas day, though we knew he is a real person. No, we don’t celebrate St. Nicholas day. Not sure I knew he had his own day until this year….! I would love to win this! WE LOVE ours and would love to give them away to a single mom, friend of ours. I’ve never heard of it. We do tell the real story, but I had no idea there was an actual day. We don’t, I am just learning about it. I hope to next year. No we don’t. I wasn’t aware of this celebration! These would be a wonderful blessing. Thanks for the chance! No, we don’t. I need to think about it earlier next year so we can! I knew of St Nicolas’ Day, but we’ve never celebrated it. No we have not, but I think that we start next year! St. Nicholas Day? Time to research it!!!! Thanks! Never heard of it, but I think we will start next year! We haven’t, but we will be reading about it this month as we study Christmas around the world. We haven’t yet celebrated St Nicholas Day, but we have visited his birthplace. Need to do some research so we can start celebrating next year! Oops, I did not follow directions. To the question: “Does your family celebrate St. Nicholas Day?” , the answer is no. We desperately need these! And no…we don’t celebrate St. Nick, but we DO celebrate Jesus! Never heard of St. Nicholas’ day, but we do, of course, celebrate Jesus on Christmas Day! We even plan on having a birthday cake for Him for our 4 children to enjoy! Have not celebrated St. Nicholas’ Day, but will look into it, would like to get more traditions started. Not usually, though we do acknowledge St. Nicholas and have a book about him from Voice of the Martyrs. I did, however, take advantage of the event yesterday to give my husband a lighted snowflake Christmas decoration we found at a second hand store on Saturday. Didn’t want to wait until Christmas to give it to him. No; we’ve never celebrated St. Nicholas’ Day. I guess I should read more about it. No. My husband and I dicussed atarting this tradition, but decided it would confuse our non-christian family members. So we encourage focusing on Christ and Santa as a gift bring from Christ. I’ve never heard of it, so no. We celebrate St. Nicholas Day every year. This year’s came with the added blessing of finding out that we’re expecting again! Would love this! I own 2 things, but love it and would love to share it with a friend! Yes, we celebrate St. Nicholas Day every year. We usually have meat and cheese fondue which our kids love! We also place a little stocking with chocolate coins at each of our children’s place settings. This is accompanied by a clementine and we also have some type of ginger bread or ginger cookie. We always read Saint Nicholas: The Real Story of the Christmas Legend by Julie Stiegemeyer and talk about ways we can show Christ’s love to those around us! We do not celebrate St. Nicholas day. Thanks for offering this give away. I am very interested in your products. Never heard of it, probably not…. Nope, no St. Nicholas celebrations for us. No, we don’t celebrate St. Nicolas day. We celebrate Christ’s birth with the Biblical festival of the Feast of Tabernacles (when He was likely born). No we just learnt about December 6th celebration about St. Nicolas last night! We also learnt that Turkey wants his bones that were stole back. Very interesting…. We celebrate baby Jesus’s birthday and we have a birthday cake, then we celebrate Tree Kings Day on January 6th. No, but it sounds interesting. Would love, love, love this package! Thanks for sharing! I have never heard of St Nicolas day. We would love this package. Thank you! I want this material to train my daughter to be a Godly woman who delights in obeying her Heavenly Father. This sort of obedience has to start with obeying her earthly parents. Please pick me!! I never heard of Saint Nicholas Day before so no, my family does not celebrate it. We don’t celebrate St. Nicholas day, but have friends that do. So we often end up talking about traditions and why we do a lot of what we do during the holidays. It is esp. helpful the way it reminds us of the kindness to others and how it can impact the world! Nope, we don’t celebrate this day….. maybe I should research it??? Thanks for the chance to win! No, our family does not celebrate St. Nicholas day. I am not familiar with it and this may actually be the first time I’ve ever heard of it. Thanks for the giveaway! I would love to win this. I already have a couple of the these things and they have really blessed my family. We use them everyday. I would share so of the items with my sister in law, who is a single parent homeschooling her daughter. But in answer to your question…no. No. Advent activities and our regular school and getting ready for christmas take up all our time! No we haven’t celebrated St. Nicholas’ Day. However, I do want my boys to know about the real St. Nicholas so perhaps one day in the future. No!! I’d never heard of it. But I certainly will be looking into it!! No we do not celebrate it. No, but we do talk about St. nicholas as opposed to Santa Claus! We have enjoyed some of your materials in the past. We would love to win! No, we have never celebrated St. Nicholas Day, but I think we need to look into it. Not celebrated the day, just always tried to tell the TRUE story – one bad incident of a well intentioned 3 yr old telling a friend that Santa was dead, oops! Please though, would LoVe to WIN this package looks g*r*e*a*t !! No, we don’t celebrate it…like other issues, I need to investigate this topic more to be fully understanding in what I bring to my kids!